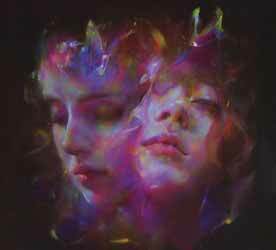 I'm all Ears is Let's Eat Grandma's second studio album, following 2016's I, Gemini. I wasn't a fan of the previous LP. I felt the lyrics were a little immature and the vocals were just too infuriatingly grating. On I'm all Ears, however, the writing has come on in leaps and bounds, the songs are... actually really good; catchy and memorable. And while the girls still sound like 12 year olds... there's a maturity and confidence to the performances that is hard not to be sucked in by. 'Cool and Collected' is the one song that sounds out of place on the album. It's almost as if someone has taken the work of Björk and Tori Amos and written it especially for the girls to sing (asking them to try to sound like Björk and Tori Amos). The LP contains 11 songs (51 min, 33 sec) with personal highlights including 'Hot Pink'; 'It's Not Just Me'; 'Snakes & Ladders' and 'Donnie Darko'. This is a more mainstream album than their debut. If you loved what they did with their previous album, you may find this a little to commercial for your tastes. Personally I enjoyed it immensely.